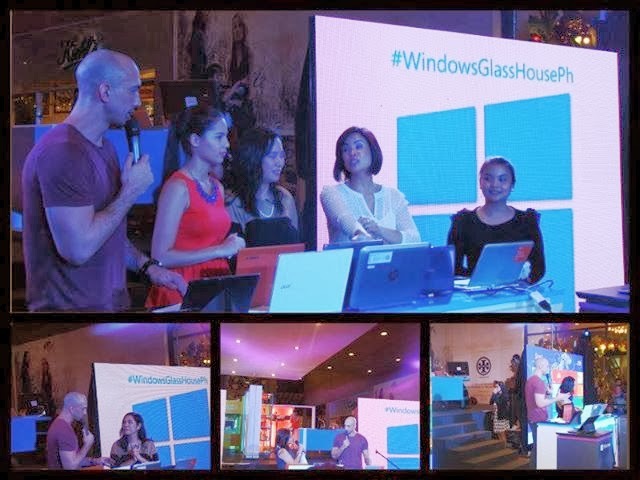 Yesterday, Microsoft Philippines launched its Windows Glass House, a life-size installation that illustrates how Microsoft technology can empower Filipino families and transform their everyday living. Designed by sisters Ivy and Cynthia Almario from the premier interior design firm Atelier Almario, Windows Glass House incorporates different Windows 8.1 devices and apps that provides personalized computing experience befitting the way people live. In the Glass House, there is a Windows app and device designed for each member of the family such as Halo (for gaming), Click the City (for lifestyle and entertainment guide), Bing Health & Fitness app (for fitness, nutritional, health and wellness needs), Bing Food (for recipes and cooking tips), Bing Travel (for travel planning), ABS-CBN (for news and information), and MERALCO (for utility management) among many others. The Glass House showcased the newest Windows 8.1 tablets such as the Lenovo MIXX2 and Acer W4. The new Asus T100, otherwise known as the ‘Transformer Book,’ also took center change as the device that is both a tablet and a netbook. Other new devices such as the Nokia Lumia 1020 were also displayed to complement the Glass House. The Almario sister tandem was commission to bring Window Glass House to life as Microsoft believes that the Almario sisters are capable of taking up the challenge of converging aesthetics and functionality and integrating technology with their design philosophy. Actress Jasmine Curtis-Smith graced the Glass House event and she enjoyed her tour of the House.